Liverpool vice-captain Jordan Henderson has told contract rebel Raheem Sterling to sign a new deal to stay at Anfield. The 20-year-old has refused to negotiate a new deal until the end of the season, and this has put his future with the Reds in doubt. However, his teammate has told the youngster that the Merseyside club is the best place for him to stay and develop according to the Daily Star. 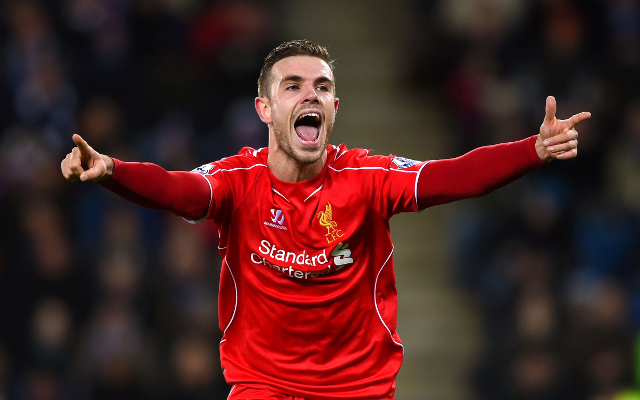 Henderson recently signed a new five-year contract worth £100,000 a week. With Steven Gerrard leaving for MLS side LA Galaxy this summer, Henderson has been tipped as a potential replacement for the skipper’s armband. Speaking about Sterling’s contract situation, the former Sunderland man had the following to say: “He has just got to do whatever he thinks is best but, if I was giving him advice, I would say ‘this is Liverpool’. “I think this is best place for him, of course. But, at the end of the day, that decision is up to him. The drawn out negotiations with Sterling are becoming increasingly problematic for manager Brendan Rodgers, who is coming under increasing pressure. The team look unlikely to qualify for next season’s Champions League, and recently crashed out of the FA Cup following a 2-1 defeat to Aston Villa in the semi finals.